A six-piece series of adventure modules set in the region of Aranure and designed to be easy to prepare and quick to run. You can easily drop these adventures into your existing campaign, play them as one-shot adventures, or play them in a series as their own campaign! Available for Swords and Wizardry (and compatible OSR games) and the Pathfinder Roleplaying Game. Long ago, the kingdom of Aranure was lost in a war against the minions of Malak, the demon lord of hate. Pilgrims have recently repopulated this land in hopes of finding peace and an easier way of life. A farmer has gone missing from the village of Rockcrest, and heroes are needed to answer the call! 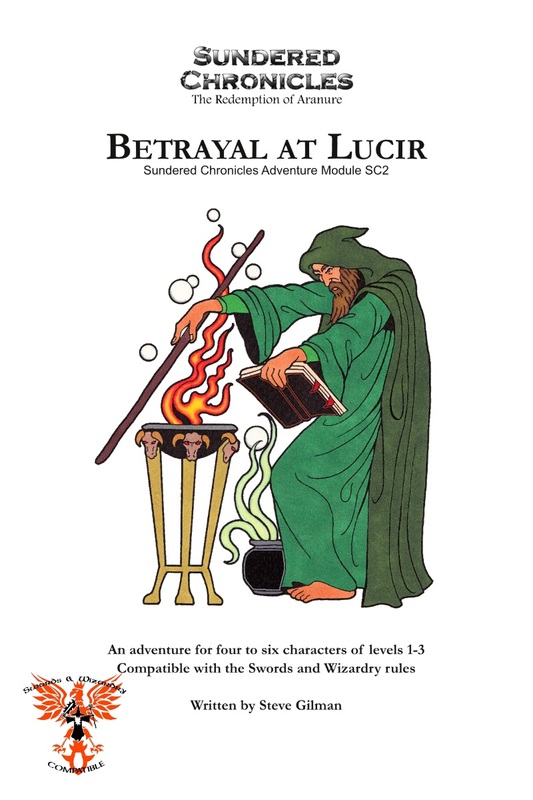 Written in celebration of Swords and Wizardry Appreciation Day 2015, this module is the first in a series of short adventure modules designed be played either standalone or dropped into your existing campaign. The Shrine of Sruukor is an adventure module for four to six characters of levels 1-3. When the kingdom of Aranure fell long ago, the fey of the Luciran Woods were a key piece of the demon lord Malak’ s forces. Many of the fey in the woods succumbed to the influence of the demon lord and rallied behind his banner. After the war was over, people returned to the town of Lucir, where they lived in peace for many years. The fey have become restless once again and tragedy has struck at the local Church of Aelastrea! The town of Lucir and the surrounding Luciran Woods, a detailed town and explorable area with room to grow. Two events designed to take a moderate length game session each to complete, and written to be modular so they can be played with this adventure or dropped into your own. Details on the religion of Aelastrea, Lady of Forests. Available for Swords and Wizardry (and compatible OSR games). Written in celebration of Swords and Wizardry Appreciation Day 2016, Dungeons of Fel’Valashar is a collection of mini dungeon adventures with a small region called Fel’Valashar that they take place within. Each of these adventures is written in such a way that they don’t have any ties to each other or to Fel’Valashar. This means you can easily drop them into your own world with no fuss. Details of the Anshuar area of Fel’Valashar. Written in celebration of Swords and Wizardry Appreciation Day 2017, Return to Fel’Valashar picks up where Dungeons of Fel’Valashar left off. In this book is a collection of mini dungeon adventures with a small region called Fel’Valashar that they take place within. Each of these adventures is written in such a way that they don’t have any ties to each other or to Fel’Valashar. This means you can easily drop them into your own world with no fuss. Details of the south-western region of Fel’Valashar.